Quite honestly, although I thought this up for my son, I ended up loving these little roll-ups just as much. I need a little protein in the middle of the day otherwise I get a little tired. But I don’t want a huge piece of chicken or steak. A couple of ounces and I’m good. I was recently re-introduced to Applegate luncheon meats and you guys know how particular I am about animal protein, so I wasn’t sure their new line of organic pre-sliced meats would meet my high standards. But it did and I am thrilled to share this find with you here. If you think that’s impossible to find, I would have agreed with you until Applegate recently reformulated their line of organic pre-sliced meats and now I am a fan. If you are vegetarian, we can still be friends and you can make these roll-ups without the turkey and sub one of their sliced cheeses instead or just make the with hummus. There are many different types of eaters out there and I am not going to tell you to be Whole30 or Paleo or vegan. I think any one of these eating styles can be wonderful if you are committed to limiting sugar, refined carbohydrates, artificial foods, and the like. 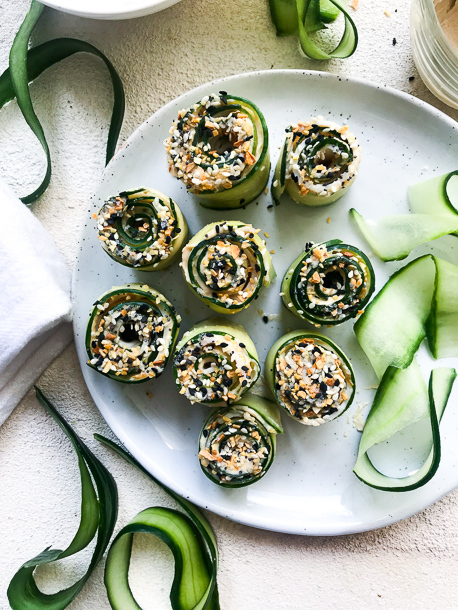 What I can attest to is that, these cucumber rolls-ups can be a lot of fun to make and don’t have to be limited to a lunch box. 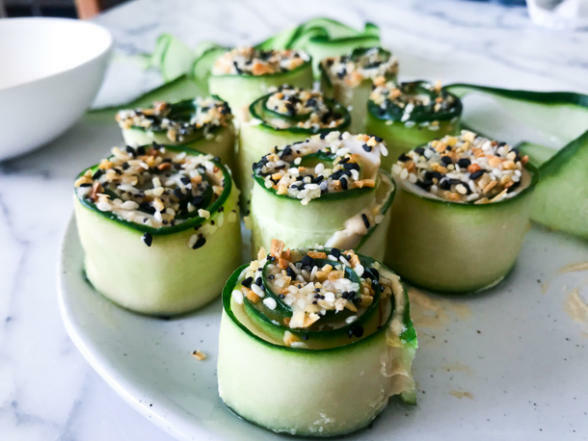 I served a version of these to my friends with drinks with cucumber + Applegate organics smoked chicken + almond milk cream cheese + finely diced sun-dried tomato. Another time for myself I made cucumber + Applegate organics turkey + mashed avocado (tends to go a little brown in the lunchbox) + Everything but the Bagel Seasoning. Totally delicious! Do check out Applegate’s website to find out more about their products and to find out what retailers near you stock their products. Hoping September is off to a great start for you and yours! I love seeing your creations, so please tag me @pamelasalzman #pamelasalzman so I can check them out! 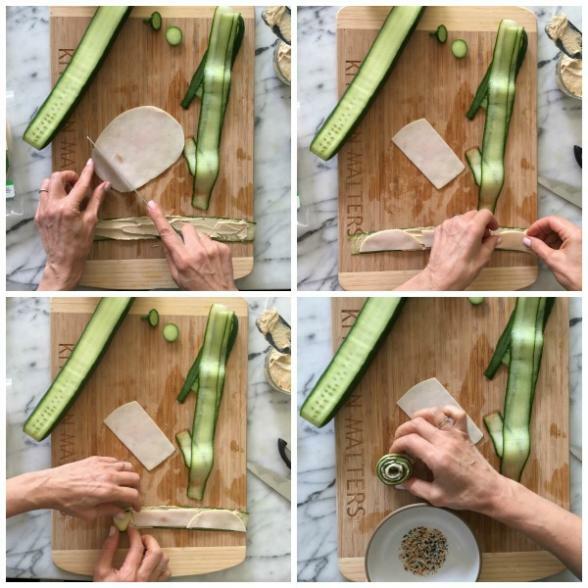 With a peeler, peel the cucumber lengthwise into thin but wide strips. Pat the strips dry with a paper towel. 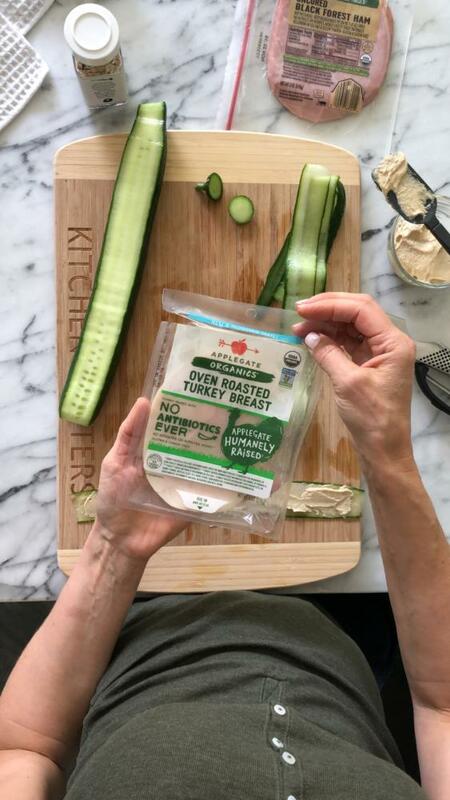 Lay the cucumber strip flat on a cutting board and spread a thin but even layer of hummus on the cucumber strip, coating one side of the cucumber completely. Cut a turkey breast slice into about ½ inch strips (or the width of your cucumber strips). Lay 2 to 3 pieces along the cucumber strip. 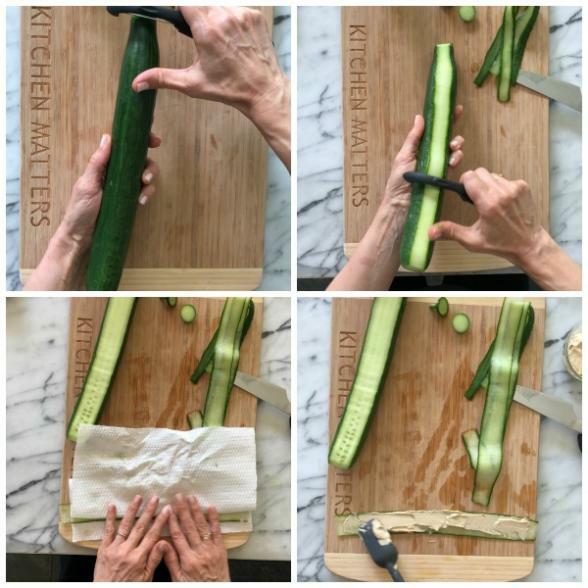 Carefully, roll up the cucumber strip. Repeat this process for each one. Place the 2 Tablespoons of Everything But The Bagel Blend in a bowl. Once, the cucumber rolls are done, dip the top of each in the blend. Made these today for the girls and I and we loved them! We used Avocado hummus on them, which was delicious. Thanks for another great lunch idea! Perfect idea to use avocado hummus! I am always looking for lunch ideas for my kids. With so many school restrictions due to allergies, I am stuck! They love hummus and I give them chips with it. Glad to find an alternative. Yes, this is nut-free and gluten-free! These roll ups are not only delicious, they lend themselves to versatility in terms of using other ingredients. I have been buying Applegate products at your suggestion since it is not always easy to find organic lunch meats. Looking forward to more recipes like this…thanks! It’s nearly impossible to find organic luncheon meats!